Let me introduce you to the concept of the Cantina. Famed for their cooking and outdoor dining have the process down to a tea - and a whole lot more. 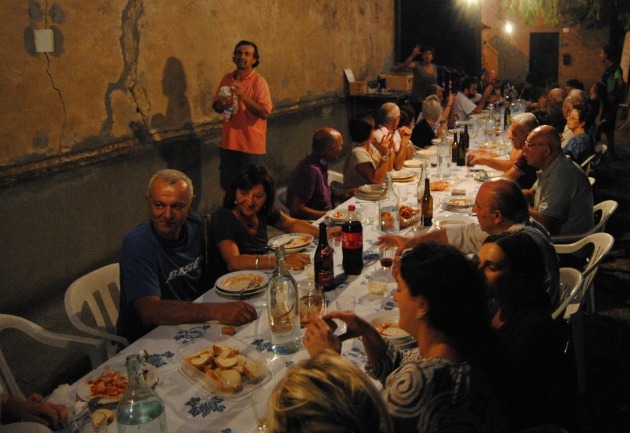 The Cantina is a tradition of many italian households and is effectively a second ‘kitchen and dining area’ that can be used to host dinner parties and create a social space that is outside of the main house. Cantina’s can also be outside as well as in. Outdoor cantinas tend to combine a pergola or lightweight structure for shade or shelter, surfaces for food preparation and BBQ or ‘al la brace’ grill for cooking on open flames. They usually combine all the practical things too, like a sink, some cupboards, tables and chairs. Whilst they are great spaces for dinner parties they create alternative spaces for socialising. If you have a busy family home you perhaps don’t all want to be doing the same thing all the time. Parents have a dinner party with neighbours whilst the kids fight over the games console in the house. What could be more civilised? At the 16th Venice Architecture Biennale, acclaimed Vietnamese architect Vo Trong Nghia (born 1976 in Phú Thủy, Vietnam) demonstrates the potential of sculptural pagoda as a shared space. Whilst this is an ambitious structure, having a large shared outdoor space at Fruit Market creates the potential for something similar. Vo Trong’s structure works in two main ways, it creates shade in the summer and shelter in the winter making this an all year around space for the whole community. As most domestic gardens are small, we often don’t consider the potential of sculptural structure beyond the scale of a domestic garden. Another example is Foster and Partners archway also at the Biennale 2018. The archway based on a common vault design often found in historic buildings can also be found in other parts of the world above ground in places like Cuba and other hot environments. These open ended spaces create an indoor / outdoor space that helps to make the outside areas usable all year round. Us Brits are used to cold weather and celebrate winter walks in the countryside too. But isn’t it time we built structure to helps us a live outside a little more in urban spaces too? The more scandi amongst us will know the benefits of good sauna, it’s great for the skin, the chest and works wonders after a few too many glasses of wine. Well, have you ever considered that a shared outdoor space is potentially a great place to house a norwegian style cabin? Traditionally the Norwegians have prided themselves on a sauna in their countryside retreat also known as the ‘Cabin’. Cabins are like a more luxurious version of the British summer house or beach hut, usually containing a kitchenette, dining area that can be converted into bed room and often a sauna. There is now a growing trend for ‘Urban Cabin’s’ popping up in the shared areas amongst houses and apartments in Norway’s capital Oslo. These spaces provide a much loved sauna in an outdoor area (far more practical than inside a house) and bookable rooms for your visitors. Smart Scandinavians are combining their urban cabins with other useful things like bike storage, laundries and much more. Why not use the shared outdoor space at Fruit Market to do something that you would all love but perhaps not that practical in your home? Getting steamy in the sauna with your neighbours might not be your bag, but how about a natural swimming pond or swimming pool or a peaceful yoga area. These are luxuries but maybe there is also potential in the idea of quiet studio or study area when you need to work at home undistracted or simple want to get deep into a book. Check out the contemporary urban cabin on Plain Magazine by JVA Architect. Make sure communal areas where people will spend time like shared outdoor seating or dining areas get at much sunlight as possible. A shady north-facing spot discourages use. Consider covered areas. Often lightweight architectural structures can make a great sculptural addition to space, creating shade in the summer and shelter in the winter. Make sure the space has a clear use. Too many developments are designed without considering how it’s going to be used, or what it’s for. Make sure the maintenance is within your capacity. How well maintained a space is directly affects how well it’s used. A shared space should cater for the needs of different age groups and interests. Good sight lines between homes and communal spaces means communal spaces are self-policed and responsibility shared. Also worth looking at is the Clyde Mews project in Brunswick, Australia. Whilst it’s a bit far for us to pay a visit, it certainly seems like it is being developed with the same values as Fruit Market. The quintessential home with three bedrooms and a private garden to the rear has ruled the roost as the ‘castle’ of choice for many ‘Englishmen’ since it’s genesis in the victorian period through to the uber-growth of the housing stock in the 1930s. This very individual and, perhaps for some, isolating approach has left little room for community and shared space, which is common in so many European countries. With housing stocks in Europe being a healthy mix of houses and apartments both period and new, the idea of sharing spaces and facilities is well practiced by our european cousins. Most of us accept that living in more integrated communities leads to a better quality of life, a sense of belonging and of well being. Despite this, very little of the UK’s housing stock is geared to delivering against this understanding. At Fruit Market, as the homeowners determine the design of their own houses and the space around them, there is great potential to rethink outdoor space and its potential for residents. In this series of articles we’ve researched interesting examples of how neighbours have put their heads together to create great space outside their homes that have transformed their community and made where they live very special places. Currently home to Fruit Market architect Matthew Letts, Headley Villas is a community of Victorian and Edwardian Houses set around a small public park. A group of like-minded neighbours came together to realise the potential of the green space in front of them which was underused and under cared for. By working together as neighbours they transform this communal area every year with an annual festival called ‘The Stuff of Life’. Like an old fashioned street party, neighbours get together with local musicians and entertainment to have an annual shindig with the local community. It’s a great opportunity for new neighbours in the community to get to know existing residents and for old friends to become reacquainted. Without the communal space creating an event like this is much more difficult. Throughout the year this space is an informal meeting point for many of the neighbours and is used for summer parties for big family visits and special occasions. The Headley Villas community has recently built an outdoor wood fired pizza oven which has become one of the focal points for the community. Community ovens have long been central to many rural community. The village bread oven was commonplace throughout europe and in particularly France and Italy. Wood fired baking died out with the convenience of electric and gas oven and commercialisation of baking but many village bread ovens survive today and there is growing trend throughout Europe to bring them back to life. Shared among neighbours, the oven is a great facility and focal point for the community and a fun way of bringing people together. Why not have a shared oven at Fruit Market? Casa Orzanam is a shared garden and allotment space in Torino, Italy, but with one main difference from a conventional allotment, it's on the roof of an large, old garage complex. A group of neighbours who lived in apartments that over-looked the site were tired of looking at an uninspiring flat roof from their apartment windows. The garage roof was easily accessible by a stairway so neighbours investigated the roof as a potential garden and growing space. Realising the roof was sound, the neighbours who were already renting some of the garages below began to build a garden and allotment space. Working with a local allotment group and beekeeper they developed the roof area into a thriving garden for residents to share, producing fresh fruit and vegetables all year round. ‘It’s not all about growing’ and works as a garden too. As a result of this innovative project a new restaurant moved into a disused shop space as part of the complex, cooking food grown on the rooftop and becoming part of the community. From a bland flat-roof to a green space and community restaurant these neighbours have transformed the way they live. Sneinton Market is open for business! Fruit Market residents offer their thoughts on why they are moving to Nottingham's most forward thinking development. Fruit Market residents offer their thoughts on why they moving to Nottingham's most forward thinking development.